Established in 2012, Funny Millions Casino is an excellent place to check out if you're tired of the traditional approach to online gambling and are looking for something different. Based on the Funnytowers platform, this site welcomes Canadian players, offering them the gambling experience they'd find in a local bar hosting a few classic slot machines. Licensed by the Government of Curacao, despite its peculiarity, Funny Millions is a perfectly safe online casino with an average return of 87%. 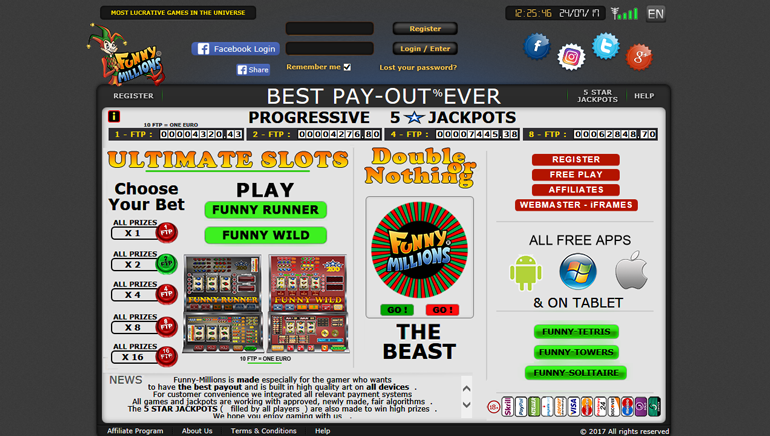 Funny Millions features an instant play platform unlike anything most players have had a chance to encounter before. The entire site has a true retro-feel to it, trying to give players an impression they are playing an actual slot machine, without too many distracting details around. Those who prefer to do their gambling on the go can download Funny Millions mobile apps for Androids and iPhones as well. 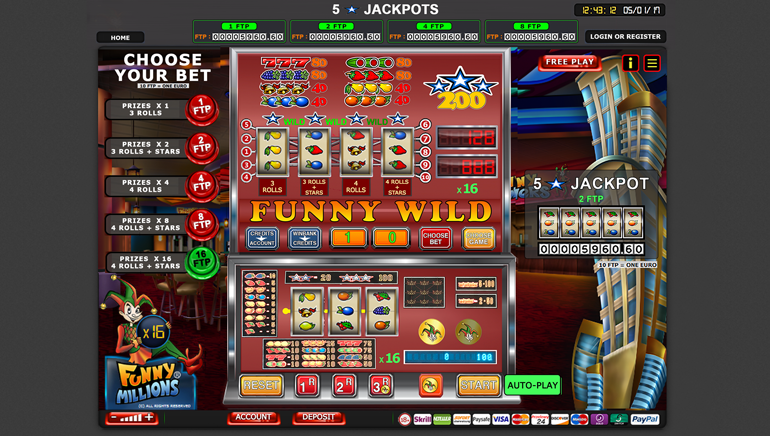 Unlike most online casinos these days, Funny Millions doesn't offer a vast library of games. Instead, they only have a few in-house developed titles, but these games will keep you entertained due to their uniqueness and progressive jackpots. Funny Runner is the most popular game. 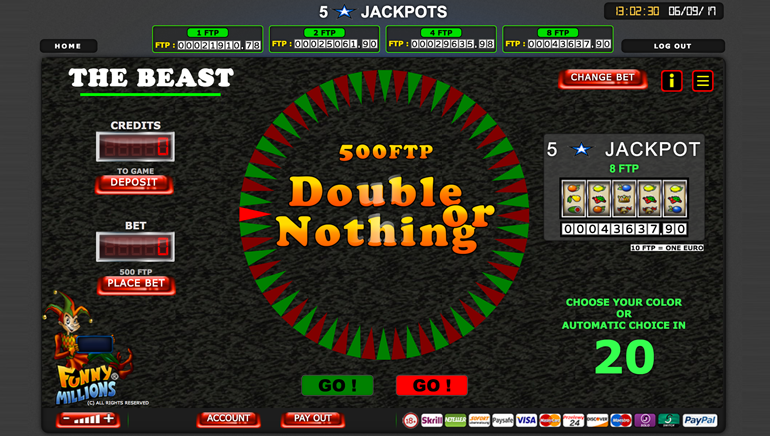 It is a classic three-reel slot, which can be played on several different levels. 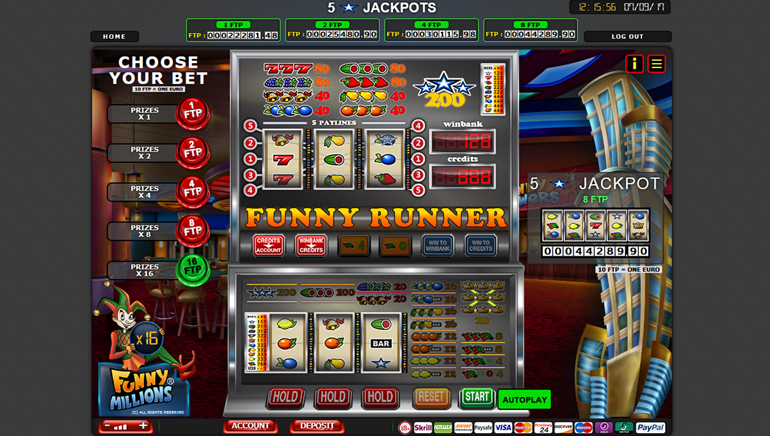 Different levels offer different, increasing jackpots. In addition to this one, there is also Double or Nothing Beast, where players simply bet on the Red or Green outcome (similar to red-black bets on roulette), Funny Tetris, Funny Towers, and Funny Solitaire. The structure of the Funny Millions welcome bonus is a bit different than what most casino players are used to, but this casino will still get you started with some nice extra money on your first deposit. In the banking department, this casino made sure that all players are taken care of, offering 12 different deposit and withdrawal methods. These include Skrill, Neteller, Visa, MasterCard, Maestro, PayPal, Discover, Paysafecard, etc. One thing to note is that all the deposits are converted into FTPs, at the rate of €1=10 FTPs, and all the wagering on Funny Millions is done in these points. Apart from a fairly extensive FAQ section, players can reach the customer support at Funny Millions through the support ticket system available on the site.